Cattle and Cane – Sugar vs the Reef ? Such a great song. Grant McLennan from the Go-Betweens grew up in Rockhampton and Cairns, both north and south of where we are right now in Mackay. 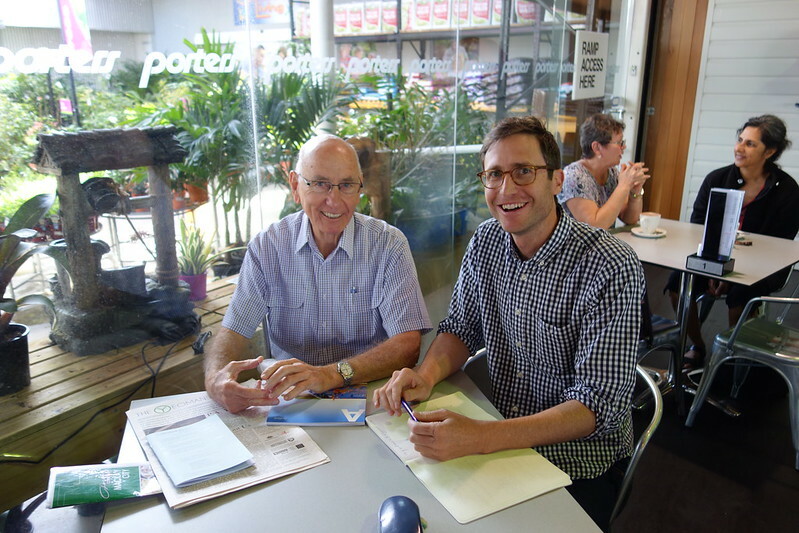 Me having a chat with local institution Ray Braithwaite (“Sugar Ray”) at local institution Porters Hardware in downtown Mackay. Photo by John Sweet. Last Wednesday, John Sweet took me to meet Ray Braithwaite, aka “Sugar Ray”. Ray was the federal MP for Dawson from 1975 (when I was born) til 1996 (when I finished university). Among the many things we talked about (including changes to tariffs for sugar imports and exports, which was a big issue during his tenure as local MP) Ray recalled his early life. He grew up helping his father Septimus on a sugar cane farm in Finch Hatton in the 1940s. In those days, instead of tractors, livestock were used to pull heavy planting and harvesting equipment through the fields. For this reason, each cane farm had a substantial proportion of its land (perhaps a third) set aside for housing and feeding animals. But with the rise of machines through the 1960s, beasts of burden were no longer needed on sugar cane farms. And these days, nearly all available land is used for growing the sugar plant – it’s very rare to see any animals at all. I had this thought bouncing around in my head a few days later when I went with Simon Mattsson to visit the farm of Richard Prior, a canefarmer who is supposed to be retired, but just can’t seem to quit. Richard was in his shed, deep in discussion with his neighbours Ray Abela and Joe (whose surname I didn’t catch). An impromptu CQSHS gathering. 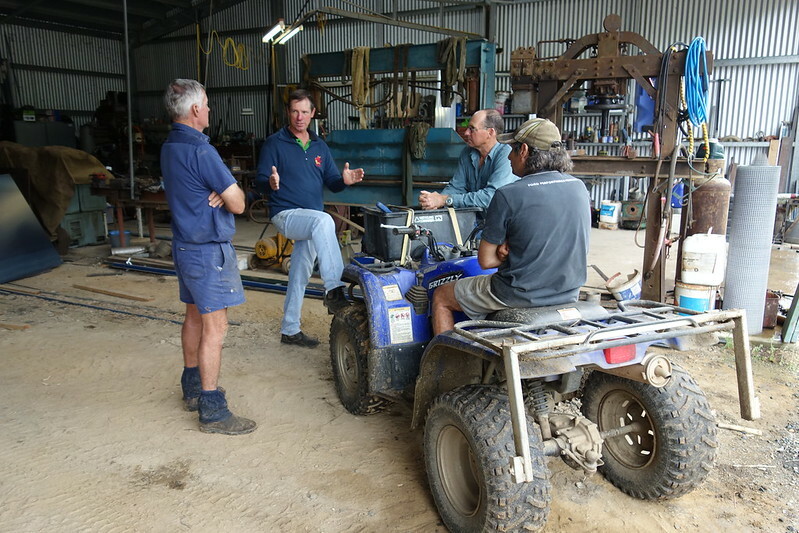 Richard, Simon (gesticulating), Ray, and Joe (on the quad bike) in Richard’s shed, solving all the problems of sugar cane farming on a rainy day. Ray, Joe and Richard were working together on the creation of a large steel hopper for spreading very fine lime on their soil. Spreading lime makes calcium available to the plants, and also helps balance the acidity caused by nitrogen fertilisers. A big sheet of steel soon to be transformed by Ray, Richard and Joe into a precision lime spreader. 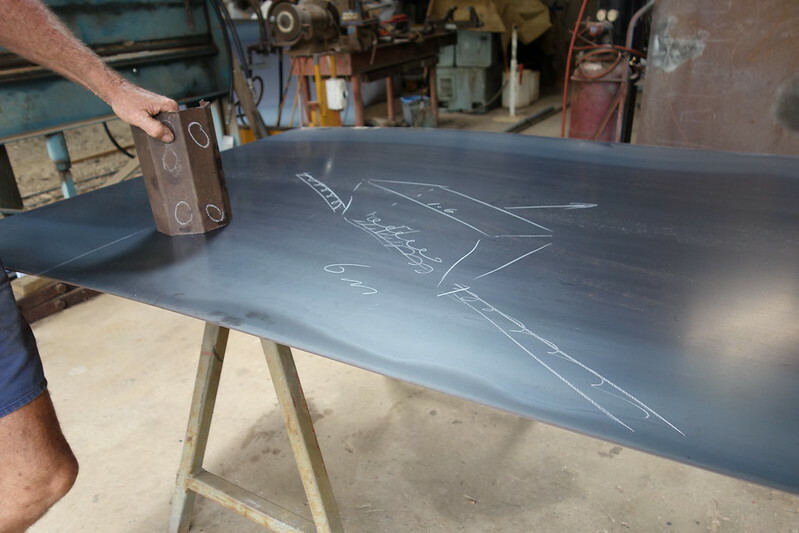 The chalk drawing on the steel shows how the lime will be spread out to the sides using a rotating augur. While they worked, the farmers were laughing (in a somewhat grim way) about a neighbour of theirs who keeps beef cattle. This guy’s cows sometimes escape, and end up in their fields munching on sugar cane. “Once they get a taste for it, you can’t get them out again!” said Joe. We usually hear about cows eating grass. And sugar cane is, as I discovered recently, a grass. So it makes sense that it could be part of a cow’s diet. Also, sugar juice is very tasty, so I suppose it also makes sense that cows might develop a taste for it. My conversation with Joe, Ray, and Richard focused on cows as a pest for canefarmers, clumsily crashing through the crop, flattening the stalks, chewing away in heedless bovine pleasure. But what about using this predilection for sugar to the canefarmer’s advantage? Simon Mattsson: the benefit of cows for canegrowers? I raised this with Simon later on. Having travelled the world for his Nuffield Scholarship, Simon has witnessed many animal+plant mixed agriculture systems. 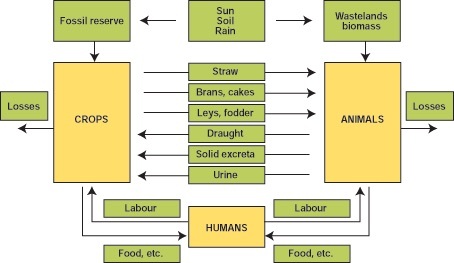 In these systems, the idea is that the animals perform a service to the plant, somewhat replacing the farmer’s labour. For example, instead of mechanically mowing your grass for hay, and then exporting all that nutrient value in bulk from your land, you might send in the cows to do the mowing in a rotational cell-grazing system. You might not get any hay, but instead you get beef (or milk), and manure, and enriched (rather than depleted) soil. (There’s even a “wikihow” page of instructions for rotational cell grazing). Mixed Crop Livestock Farming. (Diagram from here). The challenge of growing plants in isolation from any animals was raised by a local farmer growing lucerne-for-hay at Graham Stirling’s breakfast talk a few weeks ago. He was joking that his friends call him a “Moron Farmer”. I looked confused, and he explained that it’s because his soil performs so badly he always has to put “more on” (fertilisers and pesticides). He was now ready to think about alternatives, and that’s why he was there to listen to Graham’s ideas about soil health. This fairly technical article discusses the use of sugar cane as a feed for cows. But it seems to focus on the idea of first harvesting the cane and then feeding it to the cows, rather than letting the cows harvest it for themselves. For Simon, putting cows in with the cane would be a bit of an experiment. It’d have to be done with precision timing, and some serious thought would have to go into how to do it and what the benefits might be. There are some unresolved questions – for example, where would he house the cows when they weren’t in the canefield? 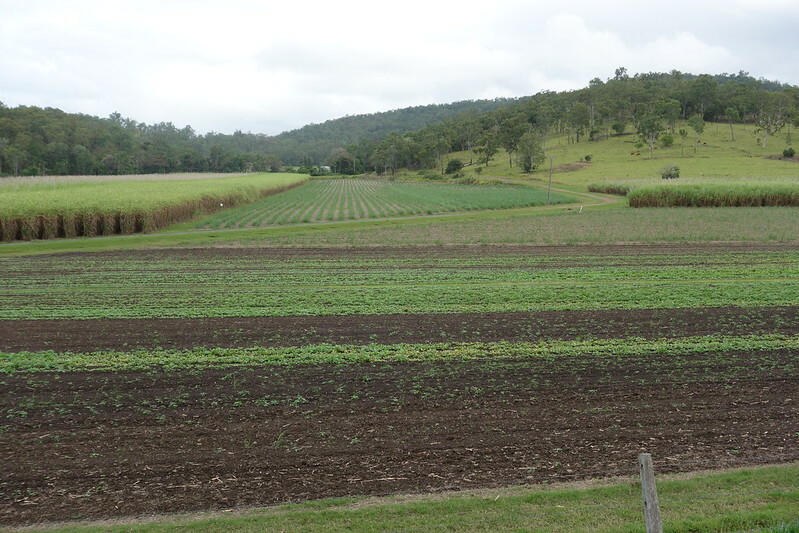 Allan and Scotty Maclean’s farm, showing multi-species crop trial (legumes and brassicas) in the foreground, sugar cane in the mid-ground, and cattle grazing pasture land on the highlands in the background. At the farm owned by Allan Maclean and his son Scotty, there’s a piece of high land with some remnant forest adjacent to the sugar cane paddocks, and Allan and Scotty have some cows up there. With this set up, it might be possible to bring the cows down into the cropping land when the time is right, and then send them back up to the highland pasture when they were done. I don’t think Allan and Scotty know about this idea we’ve cooked up for them yet. I’ll be curious to hear what they reckon. No pressure or nothin’. I received a nice follow up email from “Sugar Ray Braithwaite”, reflecting on our conversation and my ideas about cane and cattle. I’m pasting Ray’s comments below. Thanks Ray! There may be obvious problems with farming cane and cattle adjoining, as with the previous cattle prices it would not be economical to combine the two, particularly with the cost of fencing. But if areas are sufficient to place the cattle and cane close-by, that answers the problem. I have no knowledge on costs but I am sure land for cane farming would provide a better cost of return on that land, whereas cattle usually did not give a positive return, and I feel that many of the cattle being raised on previous cane farms is for “lifestyle” only and in fact in some cases a means to reduce taxation on another income. What I do see as an advantage is the use of the cane residue for fodder as freight is one of the great killers, and if it was close to the source then that is an advantage. I must say that I am impressed with the innovations that farmers are now adopting in alternative crops, not only in their use as fodder but in soil rejuvenation. Hope to meet up with you back at Porters before you leave Mackay. Oh sorry you beat me to it!! Thanks Pete! Yes Kim Williams read a draft of this blog post and pointed me to this Go-Betweens song. Such a great tune, so understated and sweetly melancholy. Yes I saw the title Cattle and Cane title in your blog list and couldn’t resist and only then scrolled back up. Ha!